I am a big fan of Amy Plum’s Revenant series, so I couldn’t wait to get started reading After the End! The synopsis for the book is definitely intriguing, and I am happy to say that the book definitely did not disappoint! The story is about a girl named Juneau, who lives in the Alaskan Wilderness with a select few survivors that managed to escape World War III. That’s what she’s been told her whole life, anyways. But after returning from a hunting trip and discovering that her whole clan has vanished, it’s up to Juneau to track down the only family that she knows. But what she discovers is that everything she knows, everything that she’s ever been told, is a lie. Juneau was such a complex character. Not only was she super smart, but she also had some psychic type powers as well that allow her to do some pretty interesting things. Having never lived in modern civilization before, she only knew how to survive in the wilderness, and this shows through her attempts at doing even the smallest things once she does venture into society. But she learns to adapt to things very quickly, which is definitely helpful in the high-tech modern world. I did find her a little hard to connect with at the beginning of the story, but I feel that this is mostly because she lived in such a secluded society. She didn’t really know how to act around people. When her path crosses with Miles, who is destined to help her find her clan, things really start to get interesting. Miles has a very hard time believing anything that comes out of Juneau’s mouth and Juneau felt much the same way towards Miles, so it was really interesting watching the relationship grow between these two characters. I really didn’t know what to think about Miles in the first half of the book. He had his own agenda for why he was helping Juneau, one that would finally make his father proud, and he seemed set on following through with that agenda through much of the book. However, I did like his determination, and by the end of the book, he had won me over. I really enjoyed the uniqueness of the storyline for this book. I’ve read a lot of dystopian books, and they all tend to blend together after a while. This book had a bit of a dystopian feeling beginning, but then merged into more of a science fiction about halfway through. Regardless, the book managed to stand out from the crowd with not only its unique plot, but with its characters as well. The end of the book was definitely a cliff-hanger ending, one that left me wondering what in the world is going to happen next. I can’t wait to get my hands on the next book. Overall, this book was definitely not what I expected, and I enjoyed it so much more than I intended to. I can’t wait to get my hands on the next book in the series. I've been seeing this one a lot lately and may have to try it! I just hate cliffhanger endings so much. I have been trying to wait until an entire series is out before starting it. If the books are too spread out - I end up forgetting everything I read. Do you have that issue? And I'm not much of a re-reader. I wish there was a website that gave cliff notes versions of series books that I could do a quick refresher when this happens. Lol. While I wasn't a big fan of her other series, I did enjoy her writing style and this is an intriguing premise. The relationship between the MCs definitely sounds like it's interesting to read about. Wow, I am a big fan of Amy Plum. 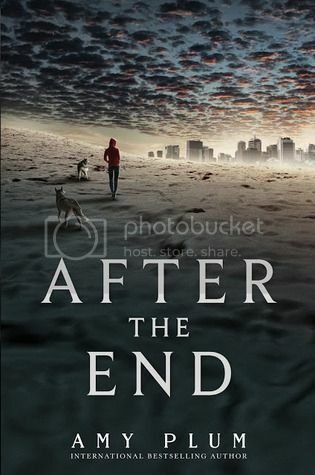 With this, I'm really excited for After the End! I liked how you described the main character. This reminds me a bit of the awesomeness of Legend by Marie Lu's MCs. Thanks for the great review! wowza i've never heard of this book before, but the synopsis + your review has me sold! kind of reminds me of The Village?